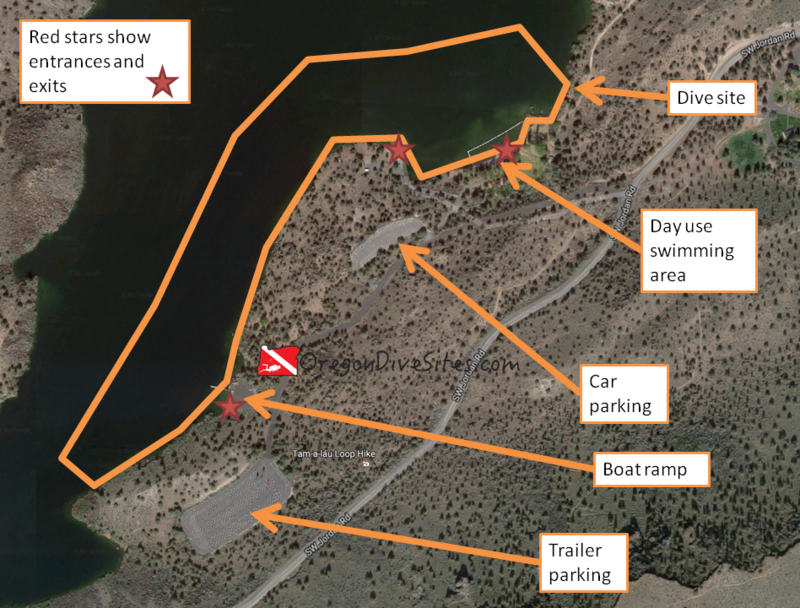 The Upper Deschutes Boat Launch at Lake Billy Chinook is a fun place to go diving in central Oregon. There are some interesting underwater rock formations along the submerged cliff walls but the site also has good areas for shallower diving depending on what you’re looking for in a SCUBA adventure. Lake BIlly Chinook. Photo by the Oregon Department of Fish and Wildlife. Copyright 2009. We like this site for the interesting submerged cliffs and underwater rock formations. There are also some good areas to practice SCUBA skills near the shore. Diving in Lake Billy Chinook is not something most people from the west side of the Cascades would usually but it is worth the drive to Central Oregon to test the waters. The nearest large town is Bend with Redmond in between. Culver and Metolius are both closer although they are smaller towns. Follow the signs to The Cove Palisades State Park and then look for the turn-off for the Upper Descutes Boat Launch and Day Use Area. There is ample parking at this site. The last time we were here, we did need to pay for parking although this may change based on the time of year. There are two parking areas to choose from. One is designated for boat trailer parking and the other is for car parking. The Upper Deschutes Boat Launch is right by the trailer parking while the day use area is by the car parking. The Deschutes upper boat launch and day use area is a big dive site that could be explored across multiple dives. The Deschutes Upper Boat Launch and day use area could be considered two sites. Certainly there is enough underwater ground to cover that the site merits at least two dives. On the southwest side of the dive site where the boat launch is located, the submerged cliffs fall away rapidly from the bank. At the northeastern part of this dive site, SCUBA divers will find a more gently sloping bottom around the roped off swimming area. We found this site to be the most fun by starting at the southwest entrance and swimming along the submerged canyon walls until we came out at the northeast exit. Swimming the opposite way you may encounter a very gentle current from the Deschutes River. The three easiest places to enter and exit are at the boat ramp (one entrance/exit) and by the day use swimming area (two entrances/exits). Around the boat ramp, be sure to watch for boat traffic and give way to other users of the upper Deschutes boat launch area. This is a shore dive although we have SCUBA buddies who have done this as a boat dive. There can be some waves from boat wakes but otherwise conditions are usually pretty mild at the upper Deschutes boat launch. Water level in the lake can vary throughout the year so be prepared for low or high water. Depending on when you go, the amount of boat traffic at the boat launch might be too great for you to safely enter or exit the water there. Visibility is usually in the 20-30 foot range except around the swimming area where it can be much less when swimmers stir up the bottom. Temperature varies throughout the year based on snow melt feeding into the reservoir and how much energy the sun has pumped into the lake. We have found a surface thermocline at this site of 60F and deeper water temperatures of 40F. We like diving this site in the early fall after most of the weekend boat traffic has left the lake and before snow starts falling in the Cascades. However, the site is accessible most of the year (although sometimes parking is not). We never went past 75 feet here but you can go much deeper if you head out toward the old Deschutes river bed at the bottom of the flooded canyon. Watch your depth gauge and remember that this is an altitude dive. Open water divers with experience diving walls can do this site. However, this is an altitude dive so you should have altitude diver training. We rate this as an intermediate dive for a few different reasons. First, the boat traffic in the area makes it more challenging to stay safe. Second, the underwater rock walls that you will be diving along can be tricky to dive if you haven’t had that experience before because you can easily go too deep or accidentally surface. Third, this is an altitude dive and requires altitude diver training. Fourth, the walks to entrances and exits can potentially be very long. Depending on the time of year and how much boat traffic there is at the upper Deschutes boat launch, you may be walking from a long way away. Expect at least a 200 foot walk from the closest parking to the boat ramp and plan for possibly 800 feet of walking. One approach is to assemble your gear in one of the parking areas, drive it as close as possible to the entrance you want to use, drop your gear off, go park, walk back, don your gear, and enter the water. Upon surfacing, doff your gear where you can pull up a car, go walk to your car and bring it to your gear, load up your gear, and take it somewhere else to break down. The lengthy walks convince some people to dive this site using a boat. Be mindful of boaters using the boat ramp. We always give boaters priority when we use a boat ramp as an entrance or exit. Several times at different boat ramps across Oregon, we have made friends by helping boaters recover lost equipment that took a swim after falling overboard at the ramp. Because of all of the boat traffic in this area, it is a very good idea to have a dive flag and use it. We have a dive flag that we highly recommend on our Gear We Use page. Remember that this is an altitude diving site and you should have training to dive at altitude. It is easy to go too deep at this site. Watch your depth gauges carefully. There is a dive shop in Bend that does air fills, services gear, and has gear for sale. We haven’t tried any of the restaurants in the area although we know there are some places to eat in the nearby towns. Please let us know if you have a favorite place to get food! 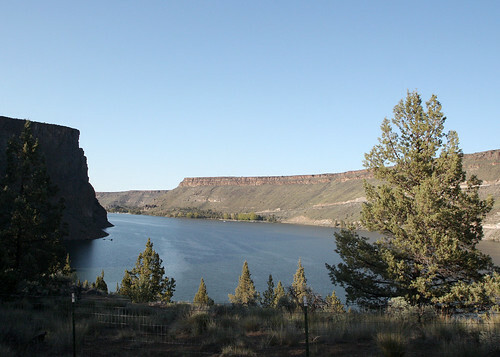 There are some state and federal campgrounds in the area, and over on the Crooked River branch of Lake Billy Chinook there is a resort with cabins for rent. Please let us know if you have a favorite place to camp around the upper Deschutes boat launch that is SCUBA friendly!